With the economy showing signs of recovery, more and more homeowners are looking to make improvements to their dwellings and one of the best ways to help them get the most return for their money is by ensuring that their property is properly insulated. A well-considered insulation install can help cut down heating bills and whilst work to attics and walls is increasingly common, it’s important not to forget about the ground beneath our feet. Floors can account for a large percentage of heat loss and if you’re constructing a new extension, or even laying a new laminate floor or carpet, it’s a good idea to discuss the benefits of insulating to a high level with the owner. Under the latest Approved Documents L to the Building Regulations, any new building elements such as floors in an extension must be insulated to achieve a U-value of 0.22 W/m².K or better in England and 0.18 W/m².K or better in Wales. In addition, if you’re replacing over 25% of an existing ground floor, the new floor must achieve a minimum U-value of 0.25 W/m².K, providing the energy savings pay back the initial cost within 15 years. Heatloss from suspended timber ground floors is usually limited by inserting insulation between the joists. The process of insulating them to a high enough level to achieve payback within 15 years is relatively straightforward providing you use the right materials. Insulation such as mineral fibre need netting to stop them sagging, and issues such as air infiltration can badly affect their performance and lifespan (suspended timber floors require under-floor ventilation). In contrast, rigid thermoset phenolic insulation such as Kingspan Kooltherm K3 Floorboard can be installed flush with the floors without the need for netting. They also offer premium levels of thermal performance, allowing the required U-value to be achieved with a minimum thickness. Let’s have a look at how to go about insulating a standard suspended timber floor using premium performance rigid thermoset phenolic insulation. To work out the thickness of insulation required to achieve compliance, the perimeter / area ratio must be calculated. First measure out the internal perimeter of any walls joined to unheated spaces, then divide this by the floor area of the heated space including any non-useable areas such as stairwells. Using this figure, refer to the product literature for the correct thickness. To keep the rigid thermoset phenolic insulation flush with the top of the joists, it should be supported on either 25 x 25 mm treated softwood timber battens, proprietary galvanised steel saddle clips, or galvanised nails driven into the sides of the joists. If nails are used, they should remain proud of the joist by 40 mm in order to provide the necessary stop for the insulation. As distances between the individual joists may vary it is important to carefully measure each gap before cutting the insulation board. This will ensure a snug fit. 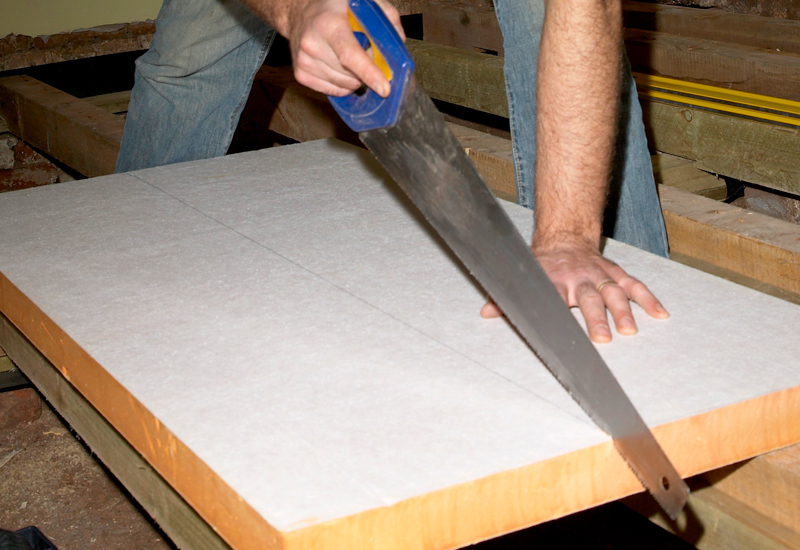 Rigid thermoset phenolic insulation boards can be simply cut with either a fine toothed saw or sharp knife and then should be slotted into place tightly butted. If there are any gaps between the joists and the wall these should filled with specially cut pieces of rigid thermoset phenolic insulation, again supported on timber battens, steel saddle clips or galvanised nails. Any gaps of less than 25mm between the insulation and the joists can be filled with expanding urethane sealant. If an extremely high level of thermal performance is targeted and two layers of insulation are required, they should be horizontally offset relative to each other so that, as far as possible, the board joints in the two adjacent layers do not coincide with each other. On each project, it’s important to give the building owner a full assessment of the available options so that they don’t waste opportunities to save themselves money. Whether installed on floors, roofs or walls, high performance insulation offers a win/win solution, maximising both the value of any work you do, and the long-term energy savings for the client.